A secret about me: I’ve always wanted to learn how to surf. It looks amazing in person, on tv, in the movies. The taming of the wild ocean wave if but only for a minute has always called to me. 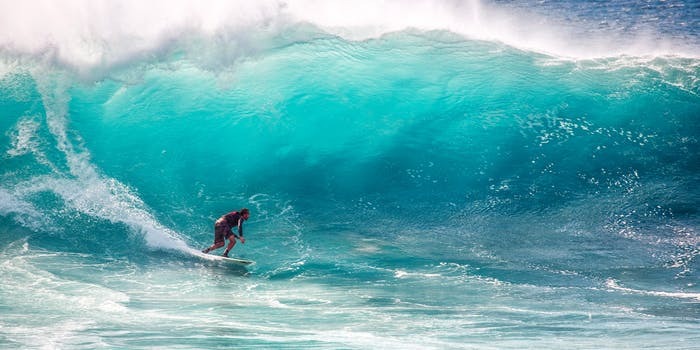 Not knowing where to start, I contacted my friend Brodey from Australia and he whipped up this nice Surfing Tips for Beginners article. Surfing seems like simple adventurous sports but never underestimate mother nature. Always ensure to be with people, it’s a dangerous sport, and should be treated as such. Learn with an instructor or, with friends. Never alone. You must keep one thing in your mind, the size of surfboard matters a lot. The volume, size, material, and fins all impact your learning. The larger the board, will typically hold greater volume, this makes it easier to float, paddle, and balance. Whilst shorter, more sporty boards look nice, they’re much harder for learning. Learning to surf on land is the advised method, you can continuously practice your standing methods quicker. Learning to stand is the hardest part of surfing. Learning this on the sand, or in the comfort of your own home is what is advised by the professionals at Surf Nation. Once you have learned this, then you’re ready for the water. Considered as a high-intensity sport, surfing is known as one of the hardest workouts in the water. Working your shoulders, back, core, arms, and legs all at once. It’s important to pace yourself. Don’t overdo yourself, and certainly don’t paddle further than your capabilities. Stay close to other surfers, if you need assistance, you can always ask. Resting is important, learn to sit on your board. You’ll spend countless hours in this position waiting for your next wave. It’s not as easy it might seem though, balancing, and maintaining a comfortable position is important. Having a good paddling technique will massively impact how long you’ll be able to spend out on the waves. You’ll spend more time paddling, than anything else when surfing. It’s so important to position your body and make large, strong strokes. Don’t try and learn yourself, get some classes, learn the basics. Use an experienced, qualified surf coach, someone local to your area. Knowing the surf conditions, swell and sandbars will make all the difference. If you want to be a great surfer then follow some do’s and don’ts. Never, ever go out whilst dark. Surfing is in the top 10 most dangerous sports, and that’s in the day. Surfing at night is extremely dangerous. Always remain in your comfort zone, don’t play with the waves higher than your capabilities. You should try the maneuvers that you’re capable of doing, don’t attempt high air, or anything that would result in someone else’s danger. Physical fitness makes your surfing experience far better. Fitness and surfing work hand in hand. A lighter, more fit rider, will be able to catch a larger variety of waves. As in the case of swimming, don’t try surfing for at least 50 minutes after the heavy meal. Always remember you are a guest on the beach and all persons are to be treated with equal respect.